Our Simply range of magazines is perfect for those of you who like puzzles that play it straight, but don't compromise on quality. They're packed with no-nonsense puzzles, in a clear, unfussy design, and a great price! 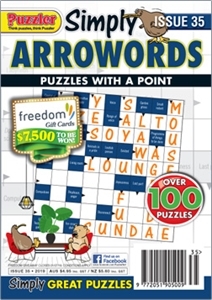 Simply Arrowords features over 100 puzzles – most are full-page puzzles, but there's a smattering of smaller arrowords for a quick tea-break solve.